Printable Black & White PDF Printable Color PDF More Paper Dolls & ClothesOne of my goals of 2018 was to try to do a paper doll for each of the major holidays. I missed Purim, but I have gotten most of them so far. Today’s paper doll is to celebrate St. Patrick’s Day. I have only drawn one other St. Patrick’s Day paper doll, so here’s my second one ever. As many of you know, St. Patrick’s Day is the feast day for St. Patrick, patron saint of Ireland. St. Patrick was a fifth-century Christian missionary and bishop in Ireland. It’s said that he used the clover to illustrate the concept of the trinity (father-son-holy ghost) and that he banished the snakes from Ireland. Interestingly enough, the earliest St. Patrick’s Day celebrations in the United States happened in Boston in 1737 and in New York in 1762. That means that the holiday was being observed in the United States before there even was a United States. Anyway, I had planned to do a St. Patrick’s Day outfit like I did for Valentine’s Day, but then it occurred to me that I didn’t have a redheaded paper doll yet and something about a redhead for St. Patrick’s Day just made sense. So, I did a full St. Patrick’s Day paper doll and an outfit. I named this new B Pose face Bridget, after the other patron Saint of Ireland, and she has jeans, sneakers and a clover t-shirt. She can, of course, wear any of the B Pose clothing, but she has a different skin-tone from Benedita or Beatrix. I hope anyone celebrating tomorrow has a wonderful St. Patrick’s Day! I’ll probably be having a quiet day at home. Does anyone have neat St. Patrick’s Day plans? Let me know in a comment. I wanted to make some summer paper doll clothing, but I confess men’s clothing isn’t my gift. Drawing contemporary men’s clothing still is something I find rather challenging, because I struggle to regularly come up with new ideas. The guy Sprite’s t-shirt today is based off one I saw a student wearing on the campus where I work. The orange shorts are well, just a pair of orange shorts. Sprites, just like every series, I think think need a mix of clothing. I really enjoyed contemporary paper dolls when I was kid, usually ones from Golden Books which had punch out dolls and clothing. I preferred the cut out books, because with the punch out books the tabs often got ripped. So, when I design contemporary stuff I’m always thinking of those old books, though today’s summer paper doll clothing owes more to what I see on the college campus where I work. Speaking of all clothing types, tomorrow there will be a historical dress and then Friday there will be something sci-fi. I’m super busy this week and will be traveling a bit, so I will try to respond to comments and emails and such, but that might not happen. 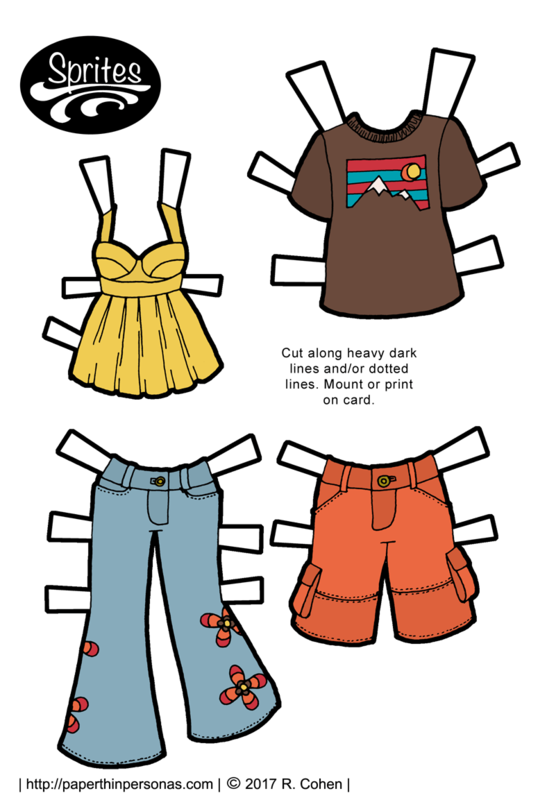 What types of paper doll clothing do you like best? Let me know in a comment! Most of us have jeans in our closets. I certainly do. In fact, since I am pretty picky about jean fit, I have three pairs of nearly identical jeans in my closet. Levi stopped making my favorite 514 curvy fit jeans and I have yet to forgive them for this, but I can still get them in talls from Amazon. Once they run out of stock, I really don’t know what I’ll do about jeans. 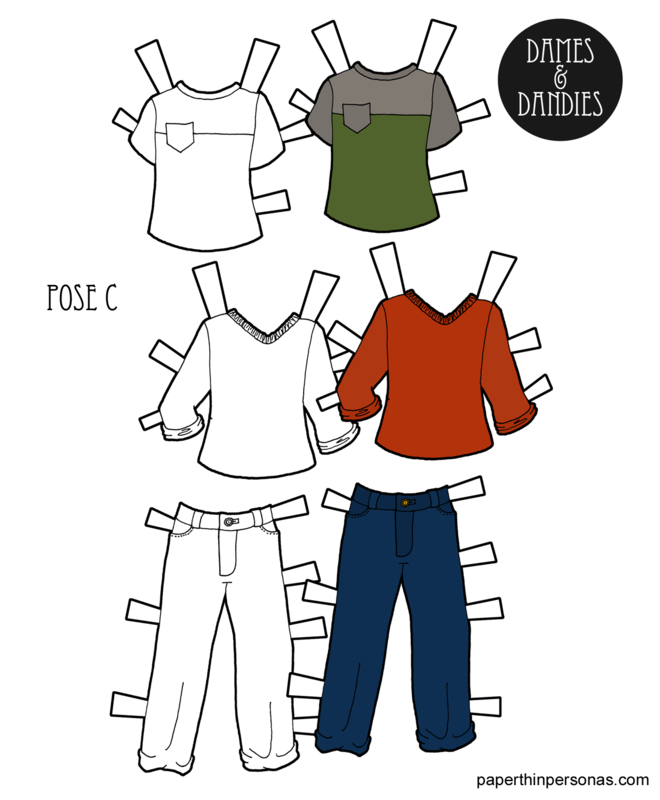 Anyway, my point is that jeans are central to most people’s wardrobes and I’ve always thought that every paper doll should have a few items that fall into the “basics” category- stuff you really need to mix and match with some of the more exciting clothing. Jeans fall into the “basics” category. 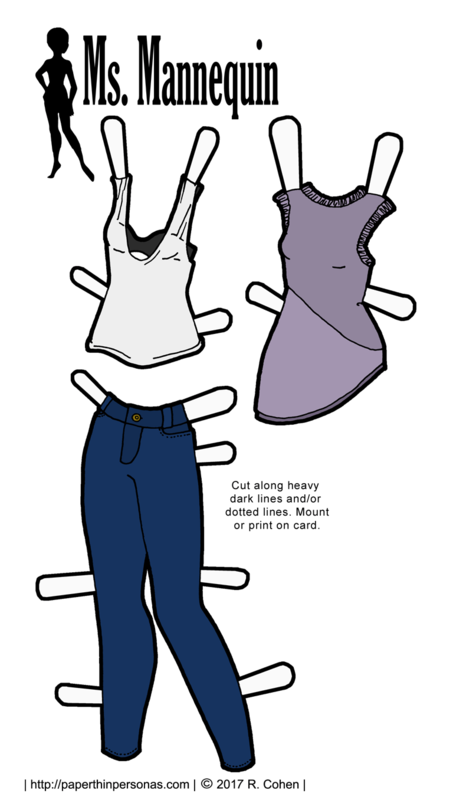 So, imagine my surprise when I realized there had literally only been one pair of traditional full length jeans for the Poppet paper dolls back in 2013 with literally the first Poppet paper doll ever Petunia. The second pair jeans are a pair of rolled shorts that I drew January and posted in February. Well, all that changes today. 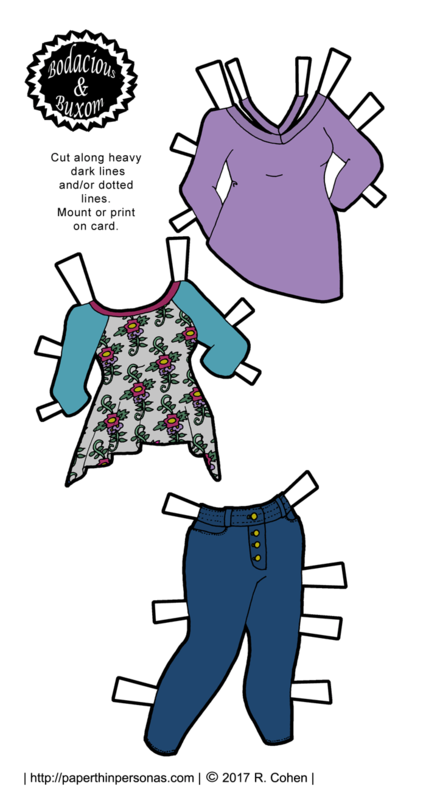 Today’s Poppet paper doll clothing set includes a t-shirt with a pink elephant on it and two pairs of jeans. One is a light colored wash with a rolled hem and the other is a dark blue flared pair. The way I see it, jeans go with pretty much any top I have ever drawn though this one might be a stretch. Ain’t gonna lie. I also drew a stuffed teddy bear, because I like stuffed teddy bears. Not every choice is well justified in my world. So, do you have jeans on your closet? Are they a favorite or a least favorite clothing item? (Also is there anything worse to shop for than jeans?) 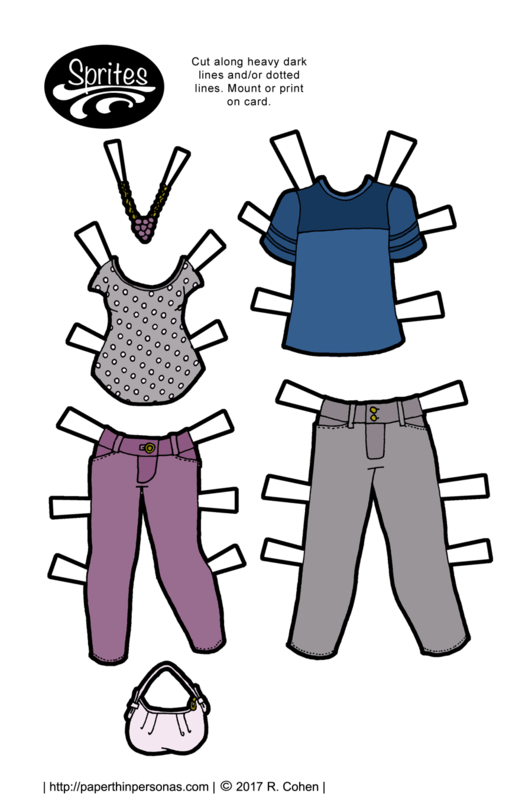 Let me know in a comment or just let me know what you think of today’s paper doll. As some of you may know, I work in an academic library, so I spent a fair bit of time observing the fashion choices of college age students. If there is one thing I have learned, it is that colored skinny jeans remain popular and that even jeans for gents have gotten much more fitted. I actually really enjoy taking break from fantasy, historical, steampunk or scifi paper doll creations to just draw some jeans. We all wear jeans, so I think embracing that idea is well worth it. I’ve been seeing a lot more guys wearing skinny jeans, so I ended up trying to draw a pair of skinny jeans for a the Sprites’s Gents. For the lady, I made her skinny jeans lavender. I’ve seen a lot of colored jeans this next summer season. I created t-shirts for them both. T-shirts are easy to draw, but hard to create new ideas are tough. For accessories, we have a pale pink purse and a statement necklace designed to match the jeans. Wanna see behind the scenes? Get a new paper doll series? Help the blog stay on the internet? Then donate through Patreon. The point is that I do believe in paper doll diversity. That doesn’t mean that I only want to have a lot of skin tones. It also means that I want variety of themes. I like variety. Variety keeps me amused. So, anyway, I am going to try to draw more contemporary stuff. After all, sometimes paper dolls want to flounce around in huge dresses and sometimes they want to wear skinny jeans. Today, I decided that the Buxom & Bodacious got some cute modern clothing. A few months back, I went shopping for some casual clothing and I tried on some things a lot like these. First of all, none of them look good on me, but that’s what paper dolls are for!